Posted on February 15, 2018 by treelawyer	tagged. It started as a simple idea: establish a court without lawyers, a place where people with a beef could be heard, where small-scale justice can be dispensed, where people found common-sense answers to problems. 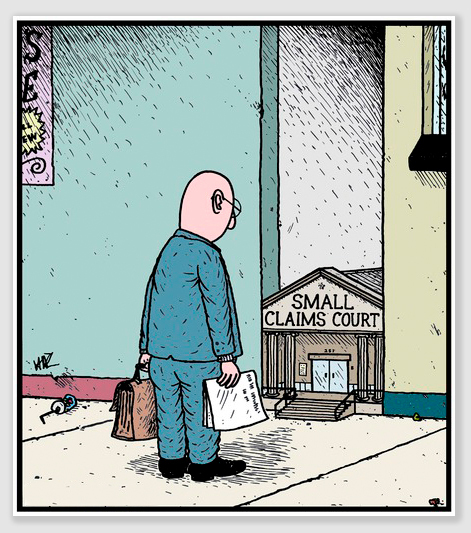 And thus small claims court was born, having its origin – ironically enough – as the “court of conscience” in medieval England. The rules are simple, the docket is swift: usually, from filing of the action to hearing not much more than a couple of weeks pass. There is no fancy-Dan pleading, no arcane procedures, no onerous discovery. Just two people with a problem and one judge to listen and decide. Many years ago, long before law school interrupted my life, I sent roses by FTD to a girl in another state on Valentine’s Day. I thought it strange when she thanked me for the “flowers.” People would normally say “thanks for the roses.” After about the third time she said “flowers” instead of “roses,” I thought to ask her what she had received from me. It turned out that I paid for roses, and got a mixed-flower arrangement suitable for a funeral… but not a beloved. When I complained to my local florist, he told me dismissively that if the receiving florist in the other state was out of roses, he or she could substitute “another arrangement of equal value.” Getting no satisfaction there, I filed a small claims complaint. On the day of the hearing, the flower shop owner stalked into the courtroom and gave me my money back. So I love small claims court. 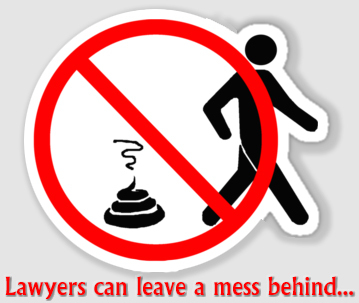 But I recognize its principal drawback, which is that lawyers can still show up and make a mess of things. That’s what happened in today’s case. Daphne Kohavy, a savvy resident of Gotham, rented a parking space in a lot next to her co-op apartment building in the Bronx. The co-op had a management company, Veritas, running the lot. Daphne’s car was parked under an oak tree, which rained acorns on her ride. This should not seem surprising to many of us who understand that those funny little acorns hanging on oak trees like to drop. But Daphne was a New Yorker, and had only the most fleeting acquaintance with green things that grow from the earth. The acorn rain surprised her, and – according to her complaint – caused over $1,500 in damage to her wheels. She sued in small claims court. Veritas brought its lawyers (in its defense, the law required it appear through lawyers, because it was a limited liability company). Its lawyers started milking the case for fees, filing motions to dismiss for all sorts of reasons. The court was not amused. 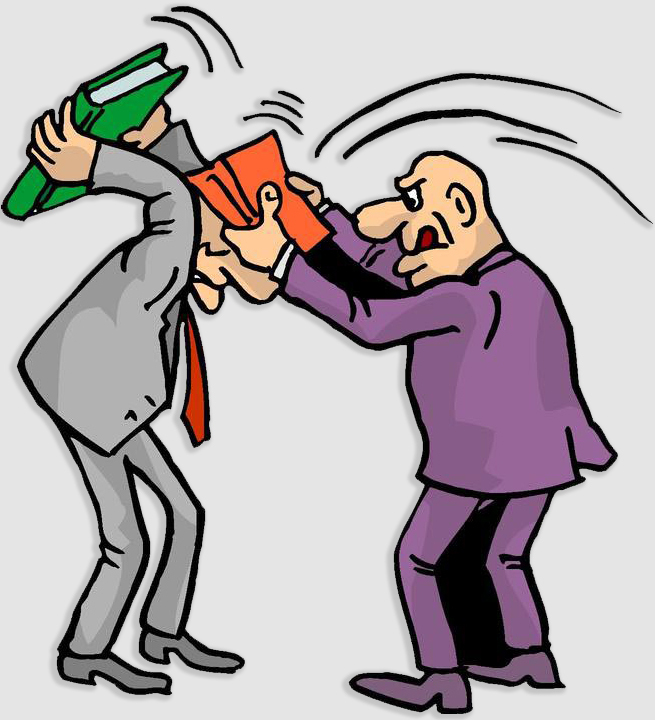 Small claims court is supposed to be easy, where parties aired the claims instead of tying each other up in “gotcha” motions. The court scolded the defendants, holding that because Daphne said the tree was defective, she should have a chance at trial to prove it. We don’t think much of Daphne’s lament. 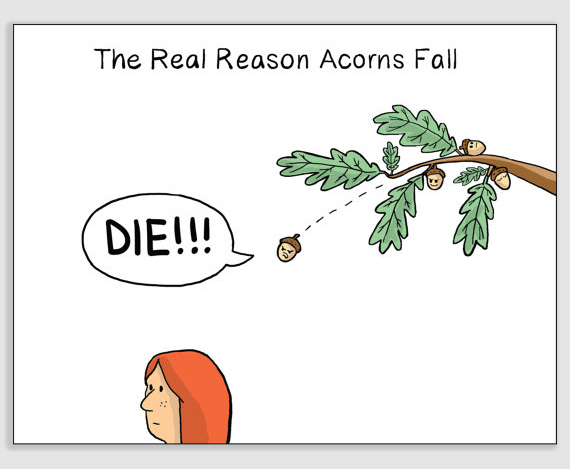 Oak trees drop acorns. That’s no surprise. But on the other hand, Veritas tried to muck up the small claims process (forcing poor Daph to go out and hire her own lawyer). Perhaps distributive justice – where the right thing gets done for what nominally is the wrong reason – triumphed. Kohavy v. Veritas Management, LLC, 2017 N.Y. Misc. LEXIS 1380 (Civil Ct. Bronx County, 2017): Daphne Kohavy leased a parking space next to her apartment building on a lot owned by defendant 511 W. 232nd Owners Corp. was the owner of the parking lot. Veritas Management, LLC was the lot’s managing agent. While parked there, Daphne’s car was damaged from acorns falling from a tree overhanging her parking space. It sounds like classic encroachment and sensible harm. She sued in small claims court for $1,500. Veritas, through its lawyers, moved to have Daphne’s claim dismissed because it was just the manager, not a party to the contract for her space between Daphne and the Co-op, and not the owner of the lot or the oak tree. What’s more, Veritas claimed, it did not maintain exclusive control of the premises, and even if it did, the law does not recognize a cause of action in negligence for damage due to falling acorns. The motion to dismiss also claimed that the Co-op could not be held liable as the damage to Daphne’s car was caused by a healthy tree, and even it was not, the Co-op lacked notice of any such defect. Held: The court began by scolding Veritas for gumming up the court’s processes with dispositive pretrial motions, noting that the “informality and convenience of small claims practice is necessarily frustrated by requiring pro se litigants to respond to formal motion practice…” But in the interest of moving things along, the Court addressed Veritas’ motion. The Court found that there was a question of fact (because Daphne had said so) regarding the condition of the overhanging oak tree that had damaged her car. While the Court said there was no privity of contract between Daphne and Veritas, “questions of fact with regards to defendant Veritas’ control over the parking lot, as per the terms of the management agreement between defendant Veritas and defendant Cooperative, exist.” If Daphne could show that Veritas maintained exclusive control over the parking lot under the management agreement between it and the Co-op, and that Daphne’s damages were the result of Veritas’ negligence, she might be able to recover in negligence from Veritas.